Everyone hopes to make it through life without getting pulled over by the police. This is a noble goal, and if you drive the speed limit and obey other traffic laws, there is a good chance your encounters with the police will remain at a minimum. However, even good drivers get pulled over, often for reasons beyond their control, such as a burnt-out taillight or stolen license plate. If this happens to you, it’s important to know how to properly handle the situation. You probably already know that when you see police lights flashing behind you, you’re supposed to take the necessary precautions and pull over as soon as you can. 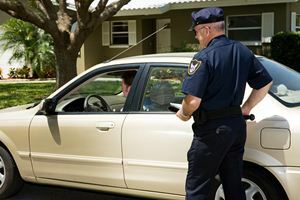 However, there are some situations in which you may not be able to pull over right away, and in these cases, you should slow down and put on your blinker to let the officer know you are looking for a safe place to stop. Simply driving ahead without doing anything may lead the officer to believe you’re attempting to flee. Once you’ve stopped, remain where you are and let the officer approach you. If you immediately climb from your vehicle, attempt to approach the officer or make any sudden movements, you might end up with a gun on you. That situation isn’t fun for anyone, so remain calm, keep your hands where the officer can see them and listen carefully to the instructions you are given. Getting pulled over can be upsetting, but it’s in your best interest to remain calm. Whether or not you did anything wrong, acting nervous or upset will only make the officer more suspicious that you are up to no good. The same goes for getting angry. Even if you think the officer pulled you over by mistake, it’s important to show respect for his or her authority. Act in kindness and you will likely get the same in return. Be careful what you say, especially if you want a chance of fighting your ticket in court. If you really messed up and are facing serious charges, it’s best not to admit to breaking the law. Most officers will ask if you know why you were pulled over, and this is one case where it’s best to play dumb. It may lead the officer to think you’re an idiot, but it won’t hurt your case. Admitting guilt most certainly could. If your charges are minor and you already know that it won’t be worth your time fighting them in court, it can sometimes be in your best interest to simply apologize. Police officers are human beings, and many of them understand that the pressures of everyday life can sometimes lead good drivers to make bad decisions. If you don’t have much to lose, you might as well apologize to the officer and see if you can possibly get off with a warning. If you do get a ticket, don’t beat yourself up about it. Most young drivers end up with one or two tickets on their record, many of which can often be removed by attending traffic school. View the ticket as a lesson learned, and move on to commit to better driving in the future.